18k gold chain bracelet dotted with stunning freshwater pearls 2.3mm white round freshwater pearl 18K yellow gold Length, about 7" Lobster clasp Made in USA. Fashion Jewelry - Modern Jewelry Designers. Amali. Color: Yellow Gold. 18k gold geometric grid drop earrings with grey diamonds Grey diamonds, 1.55 tcw 18k yellow gold Drop, 1.11" Hook closure Made in America. Fashion Jewelry - Modern Jewelry Designers. Amali. Color: Yellow Gold. 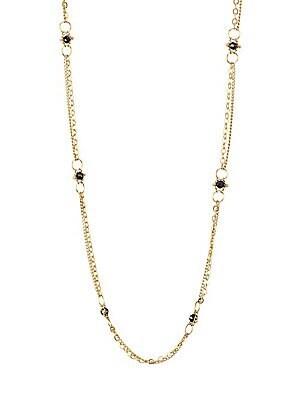 Black diamonds in gold linked chain form this stunning necklace Black diamonds, 2.15 twc 18k yellow gold Length, about 36" Lobster closure Made in USA. Fashion Jewelry - Modern Jewelry Designers. Amali. Color: Yellow Gold. 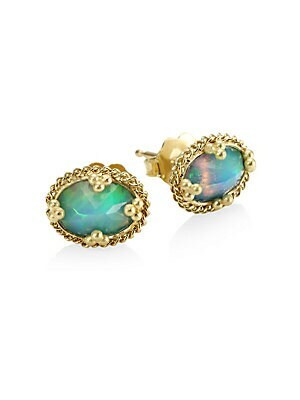 Circular studs with iridescent opal Ethiopian opal 18k yellow gold Length, 0.3" Width, 0.3" Post back Made in USA. Fashion Jewelry - Modern Jewelry Designers. Amali. Color: Yellow Gold. 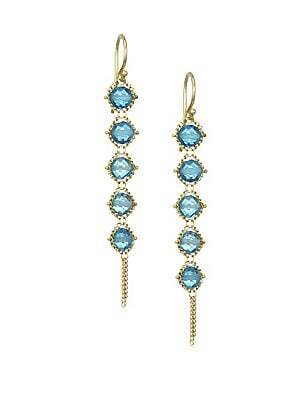 Delicate woven 18K yellow gold drop earrings set with glittering blue topaz. 18K yellow gold Blue topaz Wire back Made in USA SIZE Drop, about 2". Fashion Jewelry - Modern Jewelry Designers. Amali. 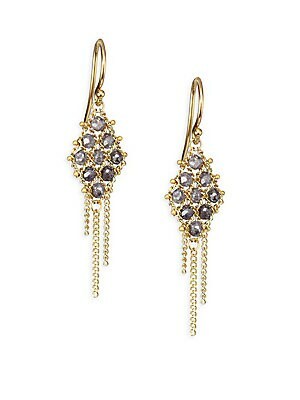 Delicate woven 18K yellow gold drop earrings set with round freshwater pearls. 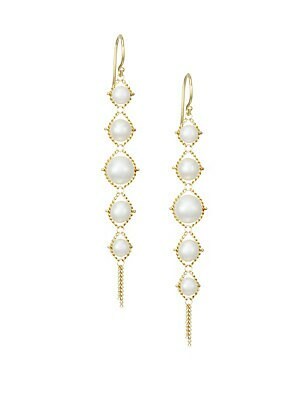 18K yellow gold Round white freshwater pearls Wire back Made in USA SIZE Drop, about 2.6" Pearl size, 4MM-4.5MM. Fashion Jewelry - Modern Jewelry Designers. Amali. Color: Pearl. Deluxe 18k gold chain bracelet with black diamonds Black diamonds, 0.75 tcw 18K yellow gold Bracelet, 7" long Hook closure Made in USA. Fashion Jewelry - Modern Jewelry Designers. Amali. Color: Yellow Gold. Deluxe 18k gold chain bracelet with grey diamonds Grey diamonds, 2.6 tcw 18K yellow gold Length, about 7" Hook closure Made in USA. Fashion Jewelry - Modern Jewelry Designers. Amali. Color: Yellow Gold. 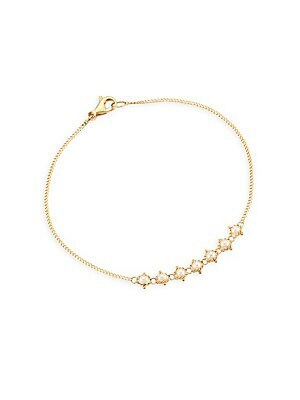 Deluxe bracelet with black diamonds accented with 18k gold. 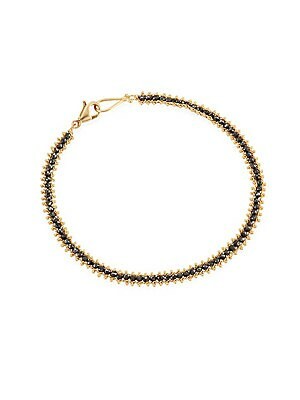 Black diamonds, 3 tcw 18K yellow gold Bracelet, 7" long Hook closure Made in America. Fashion Jewelry - Modern Jewelry Designers. Amali. Color: Yellow Gold. 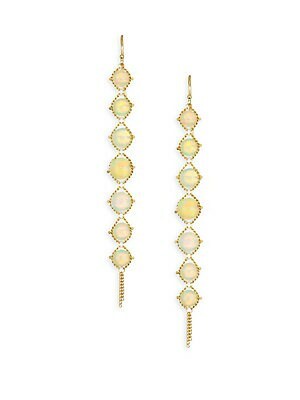 Elegant opal drop earrings set in yellow gold Genuine Ethiopian opal 18k yellow gold Drop, 2.72" Hook Made in USA. Fashion Jewelry - Modern Jewelry Designers. Amali. Color: Yellow Gold.